Say cheers, custom-style, with these Design Your Own Collection shot glasses. Here's your chance to take a shot at favor greatness with this truly-your-own shot glass from Fashioncraft's exclusive Design Your Own Collection. It's fun and fitting for all occasions and your guests are sure to appreciate the extra care you took to add a personalized touch to your - and their - day. The lettering is not the size on the photo. Ours came in Super small at the very bottom edge. Very hard to read and doesn't look right. Delivered in a timely manner. 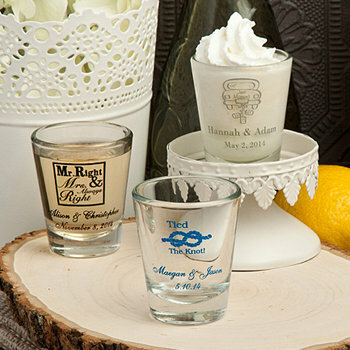 We received our personalized wedding shot glasses in a timely manner and they were packed very well. Very satisfied! I did get what I asked for, however....you can hardly read the writing on the shot glasses. Personally, I would not have sent them out this way. Writing is too small and color is too light. Best Company. I ordered 80 shots for my engagement party. They came early in the perfect packaging and the quality was excellent. I will definitely shop more here. Love it. Appeared exactly how it showed in the image preview. Centered and with wording very clear. Perfect for what I wanted! Mi ordered turned out perfect and came just in time!!!!! It was easy to set up and fast delivery. The packing was secure and nothing was broken!!!! I'm very satisfied especially bc I looked elsewhere!!!!!!!!! These shot glasses came in perfect condition! Actually even better than what we thought they would be! We ordered 40 shot glasses and not one came broken as they were wrapped and then wrapped again with bubble wrap! By far the cheapest option out there for the quality. I would absolutely recommend ordering your customized items from this website! This is the second time I ordered from NicePriceFavors and I love everything about your products and your service is awesome. I have told my friends and family about you and I will definitely be ordering again soon! Thank you! Our guests loved their welcome bags which were complemented by the personalized shot glasses. Every time they use it, they can remember the memories created at the wedding. I had mistakenly entered my wedding date as March 22, 2106. and Holly emailed me and advised they had fixed my error! THANK GOD! can you imagine being a stressed bride as it is and then have an error like that on $100 worth of shot glasses? I am so thankful, and I really love the quality of the glasses. I have one on my desk right now :) Highly Recommend! We ordered 72 shot glass favors from Nice Price Favors. They came quickly, ordering was easy, and they were very secure in the packaging. Only complaint is that a few of the shot glasses the writing was less legible than the rest, and some were not centered 100%. Barely noticeable but definitely there. I must say, for the price that i paid i was not expecting quality this good. Not a single broken glass in the entire order ( 250 ct.) very impressed an will deff. use this company again! I was a bit hesitant to order them but I took a chance after reading the other reviews. I'm so happy that I ordered them for my upcoming wedding. They are exceptionally well made and the glass isn't cheap. The design is amazing and they look fabulous. I'm so glad I ordered them for my wedding guest favors.